Fall protection kit provides a complete fall protection solution for roofing applications. 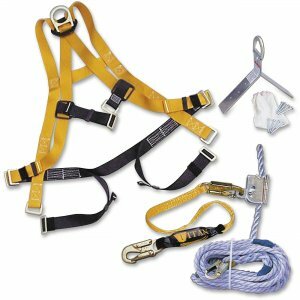 Kit simplifies product selection by providing all of the components necessary for fall protection safety and meets federal OSHA compliance. Lightweight, full-body harness features three-point adjustment, mating buckle leg and chest straps that adjust for a comfortable fit. Kit provides quick donning and greater mobility, increasing your productivity with less worker fatigue. In the event of a fall, the rope grab locks onto the rope reducing force on the worker. High-strength, 5/8" diameter, polypropylene blend, rope lifeline features a locking snap hook. Kit enables quick attachment to roof anchor and provides UV as well as moisture-resistance for increased product durability. Reusable, stainless steel, roof anchor bracket with plated D-ring is corrosion-resistant. Waterproof storage container protects equipment when in storage for a longer service life.